Adobe recently released Photoshop Elements 11, a consumer level version of their industry-standard photo editing software, Photoshop. PSE11 can still be a little intimidating to the new user, which is why a reference like Photoshop Elements 11: The Missing Manual is so valuable. Photoshop Elements 11: The Missing Manual, by Barbara Brundage, is divided into seven sections. With most how-to books I recommend reading the first few chapters, then going to the section or chapter you need when you need it. However in this case, I suggest reading Part One, then at least thumb through the rest of the book, as each section gets a bit more complex and in depth. Everyone should start with the intro. It will calm down nervous users who are afraid they’ll never understand all PSE11 has to offer while explaining to readers of all experience levels what they can expect to learn from the book. After you read the intro it will be to your advantage to read each chapter in front of your computer with PSE11 open. Download practice files from http://missingmanuals.com/cds/photoshope11mm/. (Note: the web site listed on page XVIII is incorrect.) The same web link will also bring you to other resources referred to in each chapter. Once you’re comfortable with PSE11 and ready to tackle some advanced features, Parts Two and Three cover the Quick, Guided, and Expert modes, RAW photography, using the various tools in the Toolbar, and image retouching. Layers is an incredibly important, yet feared part of PSE11. Once you understand what layers are after reading Chapter Six, and how they can help make a photo go from cool to cool! you’ll wonder why you didn’t use layers sooner. It took me a bit of practice to feel comfortable with layers; now I use them all the time. Soon you’re feeling more at ease with PSE11 and ready to expand your horizons. Turn to Part Four of Photoshop Elements 11: The Missing Manual and let Brundage guide you step-by-step on how to add a more personal touch with drawing tools, filters, actions, and text. Be patient with yourself; some fixes, filters, and tools can be a little difficult to learn. It just takes practice. I’m still trying to wrap my head around more advanced features in PSE11. Using Photoshop Elements 11: The Missing Manual and the practice files is making it much easier for me to learn. Your photos have been tweaked, cropped, adjusted, and look fantastic. What’s next? Sharing, of course! Part Five discusses creating projects, such as calendars, books, and greeting cards, plus printing and emailing photos. The chapter on sharing photos online focuses mostly on the Windows version of PSE11 and uploading photos to an Adobe gallery. If you prefer to use Flickr, SmugMug, Snapfish, or any of the other online photo services you’ll need to do it through the Organizer or the photo organizing software you use. Photoshop Elements 11: The Missing Manual ends with Parts Six and Seven: Beyond the Basics and Installation and Troubleshooting. Quite honestly, I’m not sure why these few pages were included in the book. All the web sites listed are on the Missing Manual web site referenced earlier in this review, and the troubleshooting page is sparse at best. The Appendixes online are much more useful: The Organizer, Menu by Menu, The Editor, Menu by Menu, and Lighting Effects filter tutorial. Did you know that PSE11 isn’t just for editing photos? Try creating an image or graphic from scratch. Brundage explains how starting on page 40. 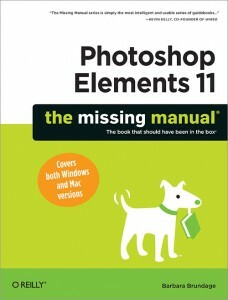 Photoshop Elements 11: The Missing Manual is a very readable book. Brundage knows a lot of the readers will be new to PSE11 or photo editing of any kind, yet she doesn’t talk down to readers or over-simplify. Lots of images, tips, and notes are used throughout the book to further explain concepts and techniques. Adobe Photoshop Elements 11 is a powerful image editing application, and chances are most readers won’t use or need a significant portion of what it has to offer, but it’s nice to know that if you’re ready to dive deeper into PSE11, Photoshop Elements 11: The Missing Manual covers all aspects of the application. I’m always talking about finding answers within an application with the built-in help files, but sometimes you just want a quick answer to a specific question. Other times you need a guide that holds your hand while you learn and experiment. Photoshop Elements 11: The Missing Manual is a great reference for both situations. As the tag line reads, this is the book that should have been in the box.